Cosette Justo Valdés is the Assistant Conductor and Community Ambassador of the Edmonton Symphony Orchestra, starting in the 2018-19 season. Born and raised in Cuba, as a daughter of amateur musicians, she’s loved music all of her life, and she began learning piano and music theory from age 8. At 18 she saw a symphony orchestra for the first time and immediately knew she wanted to be a conductor. 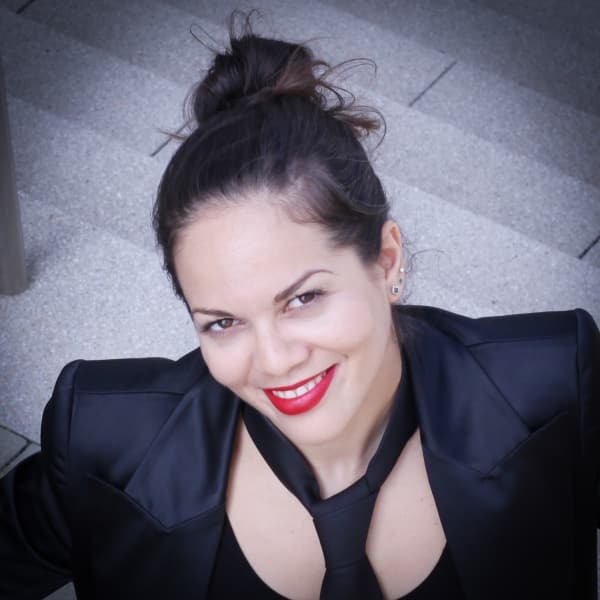 She took up conducting in 2002 at the National Institute of the Arts of Cuba, in Havana, and after graduating in 2009 with a Bachelor’s Degree in Orchestral Conducting, she was appointed Music & Artistic Director of the Orquesta Sinfónica de Oriente (OSO) (Santiago, Cuba), Cuba’s second-most important orchestra. During her first three years at the OSO, Cosette organized and conducted numerous concerts of a broad repertoire of classical, jazz, pop, and traditional Cuban music, which allowed her to start consolidating her foundation as a conductor. She also developed several programs for improving the technical and musical level of the orchestra, and founded a Kid’s Orchestra and a Youth Orchestra, both tutored by the musicians of the professional orchestra. With Cuba’s OSO, Cosette conducted premières for some of Cuba’s best known composers. She also performed the Cuban première of Domenico Scarlatti’s intermezzo La Dirindina, including designing the costumes, sets, super-titles and directing the overall artistic production. In 2012, Cosette entered the Mannheim Staatliche Hochschule für Musik und Darstellende Kunst (State University for Music & Performing Arts) in Germany, to learn more about conducting classical repertoire from the European perspective, and she earned her Master’s Degree in 2018. She has conducted many orchestral, choral, and chamber ensembles in Europe, while remaining Music & Artistic Director of the OSO and returning often to conduct it. Her passion for 20th century music inspired her to conduct a performance of Dmitri Shostakovich’s Symphony No. 1 with the National Orchestra of Cuba in Havana for the first time in more than 30 years. She also organized several large projects combining the forces of the two major symphonic orchestras of Eastern Cuba. Cosette also brought to the OSO for the first time pieces like Shostakovich’s Symphonies Nos. 1 and 5, West Side Story Suite by Leonard Bernstein (in his centenary, performed in January, 2018), Symphony No. 1 by Robert Schumann, Symphony No. 5 by Felix Mendelssohn, Pulcinella Suite by Igor Stravinsky, The Unanswered Question by Charles Ives, and others. She conducted concerts specifically for children to give them an opportunity to get to know an orchestra and its instruments. She also invited music students to listen to and play with chamber orchestras and/or symphony orchestras for the first time. Cosette conducted the OSO for the CD “Popularmente Sinfónico”, and guest-conducted several other CD recordings in Cuba. She organized the project “SinfóniJazz” for jazz quartet and orchestra, which had its first performance in December 2016 at the International Jazz Festival of Havana. For it, she commissioned music from some of the best young jazz payers and composers in Cuba. The National Orchestra of Cuba performed the première of this project, and it was a great success.